In Bestiary Stephen Mitchell has collected animal-poems from many ages and many cultures. This is a book of passionate and humorous encounters with the vibrant world of the animal. Mr. Mitchell includes excerpts from ancient masterpieces like “The Hymn to the Sun” by Pharaoh Amen-hotep IV, the Book of Job, and the Book of Psalms; haiku by Basho, Buson, and Issa; poems by Milton and Smart, Blake and Burns, Whitman and Emily Dickinson, Hardy and Hopkins. 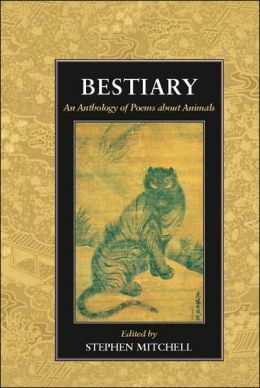 And since the animal-poem attains its full richness and depth in the twentieth century, he has included extensive selections from its greatest modern masters, Rilke, D. H. Lawrence, Marianne Moore, Ponge, and Neruda, as well as poems by other modern poets such as Yeats, Frost, Williams, Jeffers, Elizabeth Bishop, and James Wright. you fill the whole world with your beauty. your pathways cannot be seen. of everything that you made. then go out to their day of work. into the great green sea. and walks on his two feet. O one and only God! when you were all alone! or flies in the heavens above it. or clean her delicate, translucent wings. Thus, in delight, life smoothly slips away. death covers with a cloud her thousand eyes. not recognize in her a sister? The oyster, about as big as an average stone, looks rougher, less evenly colored, brilliantly whitish. It is a world obstinately closed. Nevertheless it can be opened: you’ve got to hold it in the hollow of a dish towel, use a jagged, sneaky knife, and keep trying. Inquisitive fingers get cut, nails break: it’s tough work. The prying leaves its shell marked with white circles, like haloes. Inside, you find a whole world, for eating and drinking: beneath a firmament (properly speaking) of mother-of-pearl, the heavens above recline on the heavens below, to form nothing more than a puddle, a viscous greenish bag that flows in and out as you smell and look at it, fringed with a blackish lace along the edges. Sometimes, very rarely, a globule pearls in its nacreous throat, with which you immediately want to adorn yourself. When the sugar elaborated in the stems rises to the bottom of the flowers, like badly washed cups a great effort occurs on the ground, from which butterflies suddenly take flight. From then on, the erratic butterfly no longer alights except by chance, or as if. A flying matchstick, its flame is not contagious. And anyway, it arrives too late and can only ascertain that the flowers have blossomed. Never mind: acting as a lamplighter, it checks the oil supply in each. It puts on top of the flowers the atrophied rag it carries and thus avenges its long amorphous humiliation as a caterpillar at the foot of the stems. Tiny airborne sailboat mistreated by the wind as a redundant petal, it vagabonds around the garden. Unlike sneakers, which prefer dry surfaces, snails like moist earth. They move forward glued to it with their whole bodies. They carry it, they swallow it, they excrete it. It passes through them. They pass through it. It’s an interpenetration in the best of taste because it is, so to speak, tone on tone, with a passive element, an active element, the passive simultaneously bathing and nourishing the active, which changes place at the same time as it eats. It might also be pointed out that you can’t imagine a snail out of its shell and not moving. When it wants to rest, it returns into the depths of itself. On the other hand, its modesty obliges it to start moving as soon as it shows its nakedness and reveals its vulnerable flesh. As soon as it exposes itself, it moves on. During dry periods, they withdraw into ditches, where the presence of their bodies apparently contributes to maintaining the moisture. There, no doubt, they find they are neighbors to other kinds of cold-blooded animals, toads, frogs. But when they come out, it’s not at the same pace. They have more merit in going in because they have much more trouble getting out. It might also be noted that though they like moist earth, they don’t care for places where the proportion favors water, like swamps, or ponds. And certainly they prefer solid ground, provided it is rich and moist. They are also partial to vegetables and plants with green, water-filled leaves. They eat them leaving just the veins, and cutting off the tenderest parts. They are truly the scourge of the lettuce patch. What are they at the bottom of the ditch? Beings who like it for certain of its qualities, but who intend to climb out of it. They dwell in it as a formative but vagabond element. And furthermore, there, as well as in the broad daylight of hard paths, their shell preserves their dignity. Certainly it is sometimes uncomfortable to carry this shell around everywhere, but they don’t complain, and ultimately they’re quite glad to have it. It’s wonderful, wherever one is, to be able to return home and shut out intruders. This makes it well worth the trouble. They drivel with pride at this ability, this convenience. How is it possible that I am a being so sensitive and so vulnerable, and at the same time so sheltered from the assaults of intruders, so much in possession of happiness and serenity? Thus this marvelous demeanor. At the same time so glued to the soil, so touching and so slow, so progressive and so capable of ungluing myself from the soil to return inside myself and then after me the deluge, a kick can send me rolling anywhere. I am quite sure of putting myself back on my feet and regluing myself to the soil wherever fate has consigned me and of finding my nourishment there: the earth, the most common of foods. What happiness, what joy then, to be a snail. But this drivel of pride is a mark that they place on everything they touch. A silvery wake follows them. And perhaps points them out to the beaks of the winged creatures for whom they are a delicacy. There’s the rub, the question, to be or not to be (among the vain), the danger. Alone, obviously the snail is very much alone. He doesn’t have many friends. But he doesn’t need any for his happiness. He is so well glued to nature, he enjoys it so perfectly from so close, he is the friend of the soil that he embraces with his whole body, and of the leaves, and of the sky toward which he so proudly raises his head, with its so sensitive eyeballs; nobility, slowness, wisdom, arrogance, vanity, pride. And let’s not say that in this he is like the pig. No, he doesn’t have those paltry little feet, that nervous trot. That necessity, that shame of running away all in one piece. More resistant, and more stoic. More methodical, more proud, and no doubt less gluttonous, less capricious; leaving this food in order to fall upon another, less frantic and hurried in his gluttony, less afraid of losing out on something. Nothing is more beautiful than this way of advancing so slowly and so surely and so discreetly, at the cost of what efforts, this perfect gliding with which they honor the earth! Just like a long ship, with a silvery wake. This way of proceeding is majestic, especially if we again realize this vulnerability, these eyeballs that are so sensitive. Is a snail’s anger noticeable? Are there examples of it? Since it has no gesture, no doubt it manifests itself only by a secretion of drivel that is more flocculent and more rapid. This drivel of pride. In that case, their anger is expressed in the same way as their pride. Thus they reassure themselves and thrust themselves on the world in a richer, more silvery way. The expression of their anger, like the expression of their pride, becomes brilliant as it dries. But it also constitutes their trail and points them out to the ravisher (the predator). Besides, it is ephemeral and lasts only till the next rain. So it is with all those who express themselves in a wholly subjective way, unrepentant, and in traces only, with no concern for constructing and shaping their expression like a solid dwelling place, in several dimensions. More durable than themselves. But they, no doubt, don’t feel this need. They are heroes (that is, beings whose very existence is a work of art) rather than artists (that is, makers of works of art). But here I am touching on one of the main points of their lesson, which in any case is not particular to them but which they possess in common with all beings who have shells: their shell, a part of their being, is at the same time a work of art, a monument. It lasts longer than they do. And that is the example they offer us. Saints, they make their life their self-perfection into a work of art. Their very secretion is produced in such a way that it shapes itself. Nothing external to them, to their necessity, to their need, is involved in their work. Nothing disproportionate on the other hand to their physical being. Nothing that isn’t necessary, obligatory, for it. Thus they trace man’s duty for him. Great thoughts come from the heart. Perfect yourself morally and you will write beautiful poems. Morality and style combine in the ambition and desire of the sage. But saints in what: in precisely obeying their own nature. Therefore, first know yourself. And accept yourself as you are. In accordance with your vices. In proportion to your size. But what is the proper idea of man: speech and morality. Humanism. When the rain in little slivers bounces off the drenched fields, an amphibious dwarf, a short-armed Ophelia, barely as large as a fist, sometimes springs under the poet’s steps and plunges into the nearby pond. Let her run away if she’s so nervous. She has pretty legs. Her whole body is gloved in waterproof skin. Barely meat, her long muscles have an elegance neither flesh nor fish. But to escape one’s fingers, the virtue of fluidity joins in her with the struggle to live. Goitrous, she pants . . . And this heart that is pounding, these wrinkled eyelids, this haggard mouth move me to let her go.